As regular readers with know, I recently ventured to New York, seeing such sights as the Empire State Building, Central Park and MoMA. These were wonderful experiences, but I wanted to write about something a bit more troubling here. I spent a lot of time researching contemporary poetic responses to events of mass death in the twenty-first century for my Masters dissertation. My main chapter was devoted to Simon Armitage's poem 'Out of the Blue', which deals with the September 11th terrorist attacks. I don't wish to seem morbid, or insensitive, but the ways writers respond to these events holds a deep fascination for me. As such, I was keen to visit the newly opened 9/11 Memorial. I have tried to scrutinize my wish to visit this place. In part it stems from a desire to understand what happened that day, a wish to feel connected to the people, and the place where one of the defining world events of my generation took place. I am fascinated by history, and have visited various memorials/sites of great tragedy in my time; WWI and WWII battlefields and cemeteries, and Auschwitz (on school trips). To say I enjoyed visiting these places wouldn't be accurate, but I did feel closer to the events, and more connected to the history as a result of visiting them. 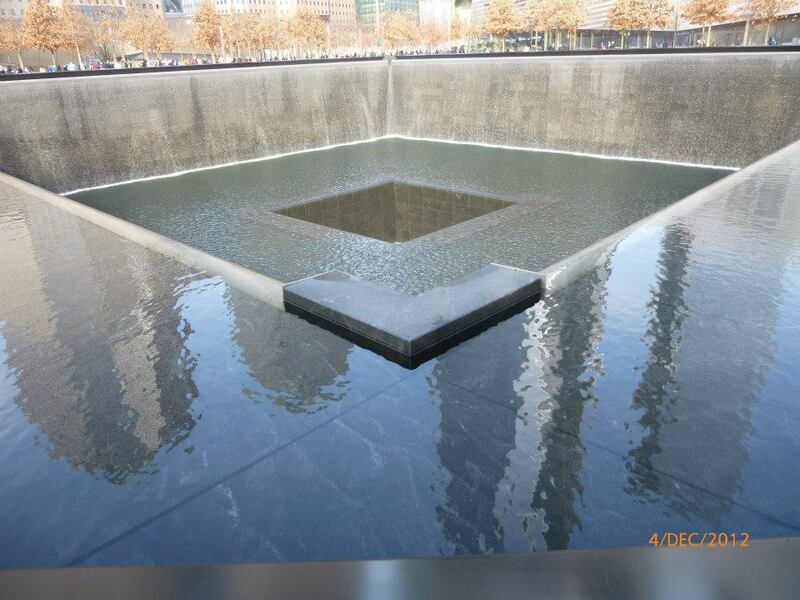 The 9/11 Memorial consists of two great sinking water features in the exact place where the twin towers stood. 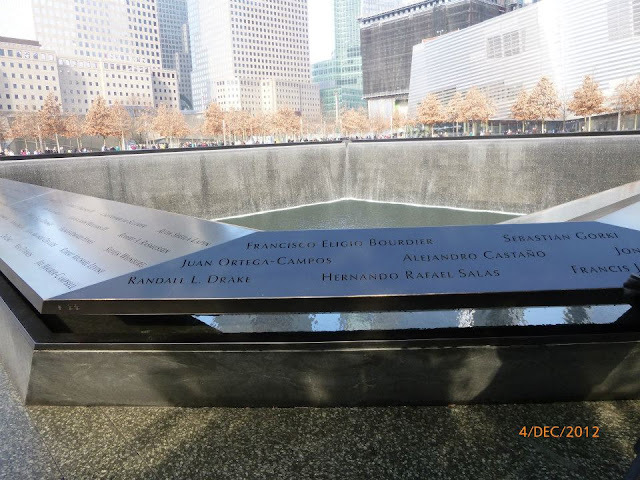 The names of those killed are carved around the edge of each. My experience of visiting this memorial was not as powerful and moving as something like my visit to Auschwitz. In part this is due to the building work that is going on around the memorial, with a new World Trade Center site in development. I imagine once the cranes and diggers have disappeared people will be better able to focus on the sound of the water, and the surrounding gardens, which are lovely. However, I wonder how the memorial will stop becoming just another tourist attraction. As we exited, we were guided into a shop. Expecting books and films about the events, I was surprised to see Twin Towers fridge magnets, 9/11 Memorial t-shirts and bracelets, along with the other tourist tat you'd expect in a gift shop. This is where it gets problematic as far as I'm concerned. I was perfectly willing to give (and did) a donation to the 9/11 Memorial and Museum, but I can't help wondering who buys a twin towers fridge magnet, or key ring, or book mark? I believe the memorial is important, particularly for those who lost loved ones in the attacks. So many of them did not have bodies to bury, so the ability to visit this place and remember is extremely valuable. I also think it's important for the rest of the world to have a place to go; the media ensured that it was not just an event that impacted Americans, but a grief that spanned the globe. But what do the victims' families think of these souvenirs? Buying them would seem to confirm people are increasingly acting as grief tourists (like the scores that visited the Wootten Bassett repatriation ceremonies), spurred on by a morbid fascination. The aim of the memorial is surely to provide a quiet place of reflection? It's not the same as visiting The Empire State Building, but the presence of the fridge magnets reduces the memorial to just another tourist attraction. I find it difficult to stomach because it feels as though these souvenirs aim to profit from the deaths of nearly 3,000 people. And that just isn't right.